Every week I'm grateful not as just a reviewer but as a fan of comics to see so many titles with leading women at the center of the story. It's even more heartening to see those characters written by women as well. 'Rose' #1 is one such title featuring Meredith Finch as writer leaving the art duties to Ig Guara and colorist Triona Farrell. It's a promising new fantasy about a girl with hidden powers that must survive her cruel reality to bring back balance and peace to her world. Like most fantasy debuts, 'Rose' builds its world establishing the power structures, the forces of good and evil, but also takes on the allegory of modern day dictatorships and the oppression of certain people. In this case, those that are being hunted and executed for being different are people with magical powers. It's a mass genocide as civilians are killed along with those who have or might have powers. The powerful sorcerous Drucilla is the vicious villain commanding her army to cause all this destruction and Rose is on the run trying to stay alive and fulfill her destiny as a Guardian, a magical warrior paired with a giant feline ally known as Khatz. Finch delivers a fast-paced and well-imagined story that feels and looks fully-realized. The once-peaceful land where magic was commonplace and welcomed has been turned upside down and the anxiety and fear Rose feels transfers to the reader. While Rose doesn't develop too much as a character, she's constantly in distress, her rival the evil Drucilla eats up the scenery with requisite mustache twirling. The stakes are established and the villain is proven to be quite formidable. And with that 'Rose' is off and running. Guara creates such a vast world as you'd expect in fantasy but it's lush and detailed. The character designs are varied and a lot of attention to detail in hair and attire make this a top-notch title. Triona Farrell provides a subtle array of colors but the schemes seem to illustrate a fire and ice aesthetic. Rose's scenes seem to incorporate a lot of orange, yellow, and red whereas Drucilla's involve blues, greens, and white. She really sets the tone from scene to scene. 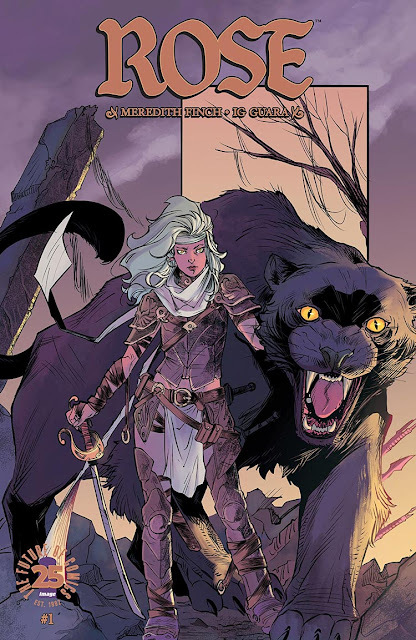 'Rose' #1 is off to a great start with a well-executed high fantasy that looks great and is compelling. A tale of tragedy and revenge that smartly sets the stakes in the first issue, introducing the threat and the eventual savior. Finch and Guara work seamlessly together to create a comic worth reading and getting immersed in. 'Rose' is a winner.